One of the ultimate highlights of the Axor brand is certainly the Axor Starck V design line. With Starck V, Axor is bringing something completely new to the market: a transparent washbasin faucet. This revolution originated from the idea of making water in the tap visible. A water vortex is formed in the faucet in a transparent body of crystal glass and represents the new eye-catcher in the bathroom. The transparent washbasin taps are available in two heights: 216 mm and 251 mm for a top washbasin. The handle can be placed on the right or left, and the faucet can be swiveled through 360° (in two steps: 120° and 145°) for greater freedom of movement. 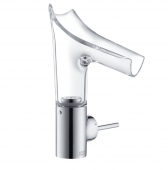 The faucets are made of crystal glass and metal, which can be installed in all 15 colors of the Starck brand. The spout has a projection of 125 mm and can be removed, making it easy to clean and replace. For better hygiene, the spout can even be washed in the dishwasher. If water is turned on, the spout can still be removed. A safety mechanism ensures that the water then turns off automatically to prevent flooding. After the water has been turned off, some water remains in the faucet base. However, this does not have to be spilled out after each use. Only before a longer absence is it recommended to pour out the water. The transparent faucet is also available as a two-hole version. The handle can then be positioned flexibly to the right or left. The two-handle faucet has a height of 216 mm. The glass spout can have different cuts, which together with the flexible color choice provides for even more individuality. Either the spout is restrained smooth or it has a diamond cut (grooved at the bottom) or a faceted cut (wider recesses in the lower part). 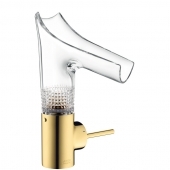 The Starck V faucet is also available with a porcelain spout. However, it is then of course no longer transparent. In this version, the tap almost blends with the ceramic of the washbasin.